This month I had the pleasure of being interviewed by the International Diabetes Federation (IDF). 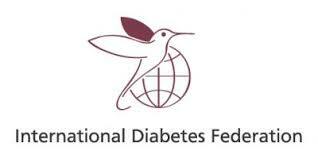 IDF is a global advocacy organization representing more than 200 diabetes organizations around the world. IDF’s mission is to increase public awareness of diabetes and encourage prevention and better care for people with diabetes. You may notice this November some buildings will be lit in blue. Blue is the global color for diabetes and this blue circle above is the global symbol. It was created by the IDF. Every two years IDF holds a conference, called the World Congress, where scientists, researchers, medical professionals, industry people and representatives from around the world come together to learn and share. Last year it was in Dubai, where diabetes is rampant – 1 in 4 have diabetes – and I had the pleasure of being invited as media from the Huffington Post. Now that was a trip – in every sense of the word! I also had the distinct pleasure of getting to know several of the hard-working folk from IDF and hope to join them again December 2013 when the World Congress moves to Melbourne, Australia. But for now, have a read. 7 brilliant answers to 7 interesting questions. ← What does it take to help patients change behavior?